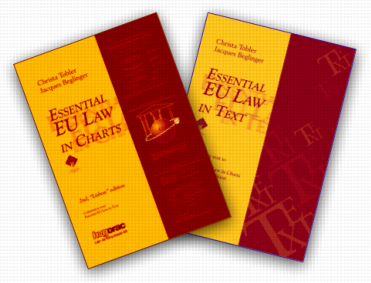 A German translation of Essential EU Law in Charts, 3rd edition, updated to status mid 2015, is available on the present website for an initial phase as a free download, ISBN 978-3-033-05419-6. Tobler Christa/Beglinger Jacques, Essential EU Law in Charts, updated and slightly extended 4th ed., Budapest: HVG-Orac 2018, 298 charts, 403 p.
Tobler Christa/Beglinger Jacques, Essential EU Law in Text, [companion publication to Tobler Christa/Beglinger Jacques, Essential EU Law in Charts], updated and slightly extended 4th ed., Budapest: HVG-Orac 2018, 126 p.
Combo-Edition: Both books "Essential EU Law in Charts" and "Essential EU Law in Text'' together. Target audience: compliance professionals, students. Addresses all new block exemption regulations. 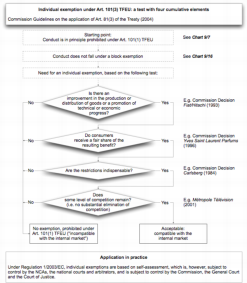 143p..
– Direct EUR-lex access to all regulatory texts and cases cited in the book.